Derek Fordjour has been named as a recipient of the 2018 New York State Council of the Arts / New York Foundation for the Arts Prize, now in its 32nd year. The NYSCA/NYFA Artist Fellowship Program makes unrestricted cash grants of $7,000 to artists working in 15 disciplines, awarding five per year on a triennial basis. The program is highly competitive and this year’s recipients and finalists were selected by discipline-specific peer panels from an applicant pool of 3,071. “Artists deepen humanity and help us to understand the world and each other through their work,” said Michael L. Royce, Executive Director, NYFA. “We’re proud to collaborate with NYSCA to offer unrestricted grants to artists of all disciplines across New York State to support their artistic visions,” he added. Derek Fordjour was born in Memphis, Tennessee to parents of Ghanaian heritage. His work has been exhibited in numerous venues including Sotheby's S2 Gallery in New York City, Roberts & Tilton Gallery in Los Angeles, and Galleria Monica DeCardenas in Switzerland. He was awarded 2016 Sugarhill Museum Artist-in-Residence, 2017 C12 Emerging Artist Award and the 2017 Sharpe Walentas Studio Program in New York City. 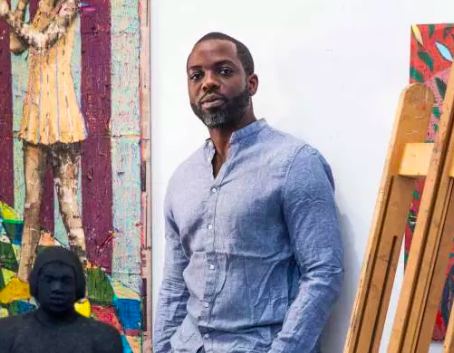 He is a graduate of Morehouse College in Atlanta Georgia, earned a Master’s Degree in Art Education from Harvard University and an MFA in painting at Hunter College. His work has been reviewed in the New York Times, Los Angeles Times, Hyperallergic and Brooklyn Rail. He has also been featured in several publications such as Forbes Magazine, ESPN’s The Undefeated and VICE Creators. He frequently serves as a Visiting Critic and Lecturer, most recently at Yale University School of Art and The Cooper Union. His work also appears in several collections throughout the US and Europe including JP Morgan Chase collection and Dallas Museum of Art.